Frequent readers of this site know that my dislike of “blue” raspberry began in the mid-nineties when candy companies decided to add the flavor to their portfolios. Sadly for all raspberry fans this artificial “blue” variation of the fruit they loved so much tasted nothing like the real thing. With all that said the soda lined up for today is C&C Blue Raspberry. I tell you about my dislike for the flavor beforehand so you might know that this review could be written with a bit of unintentional bias. Let me also clarify that I don’t hate the flavor of blue raspberry; it just disappoints me to a level that shouldn’t exist for such a trivial matter. Onward. 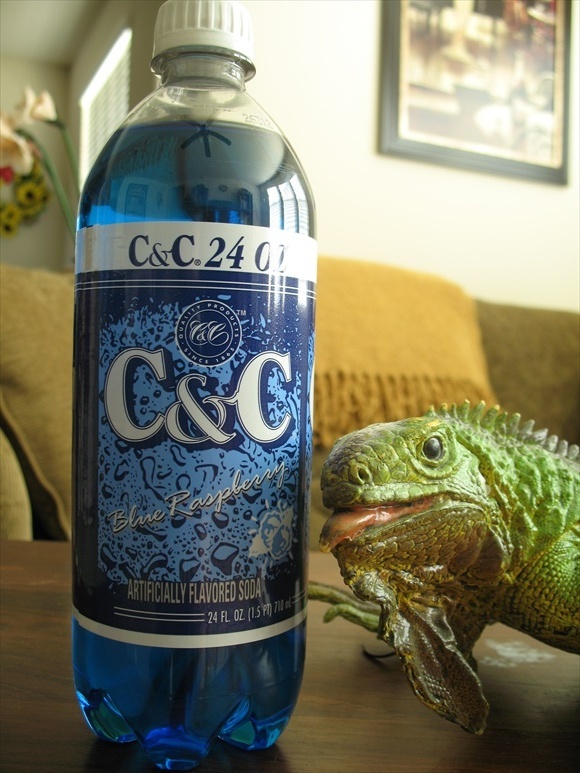 Pleasantly upon opening this bottle of C&C Blue Raspberry I was greeted with a very raspberry-esque aroma that will hopefully translate into a raspberry-esque flavor. My hopes are slightly raised, but my mind is still doubtful on how much I will enjoy this. Well the carbonation levels have started this review off on the right foot at least. Very strong and punchy bubbles take my mind off of what the flavor on the side of the bottle reads. The blue raspberry flavor doesn’t sadden me as much as I originally predicted. Perhaps this is a case of me growing up a little bit? Probably not. Soap is a familiar flavor to me when it comes to testing blue raspberry concoctions. Thankfully C&C Blue Raspberry has little to no hand soap aftertaste which pleases the palate. Now here is where blue raspberries weakness shows through. Raspberry as a fruit is more tart than sweet and blue raspberry decided to take that rule and turn it upside down. This is probably why the candy companies hopped on the blue raspberry train so many years ago… well that and the fact they probably wanted to spruce up their candy colors at the same time. This sweeter than tart taste sensation for whatever reason does not worth with my taste buds. The whole ordeal seems out of order to me and I haven’t really found a flavor that duplicates the feeling. With all that said this isn’t a bad soda, but it’s nothing special either. With my bias included I still feel good about giving C&C Blue Raspberry the score I’m about to.